Celebration! To me that is what food is, a celebration of life, something to be celebrated and enjoyed like a present, a gift, something to take one’s time over and enjoy. While I admit to being the occasional victim of fast food imbibing, I am otherwise a full supporter of slow food. Taking my time to get the best results, then sitting down with friends at a fully set table and just slowly enjoying the experience, the food, the wine and chatting during each course, hence my lunch or dinner parties often taking four to six hours. Sometimes to get the best results from food, to get the full enjoyment from it, patience is required along with a little forward planning. None more so maybe than with marinating foods. When I said last week I would be tackling barbecuing, I received emails asking about the process of marinating foods beforehand . . . the whys and wherefores, etc. So this week we are starting on a journey, a journey that starts with marinating and curing, which are closely linked. Then next week I will cover BBQ foods, followed up by recipes for ice cream . . . a great way to help finish a BBQ. So this week is more about learning and understanding than it is about recipes . . . but fear not there will be some. So to find out all about marinating and marinades over to the Tallyrand Food Tips section. Now a recipe . . . this is a simple recipe for making your own cured side of salmon, known as gravlax, gravad laks and other spellings. It is a Scandinavian specialty that is expensive to purchase, yet so easy to make yourself . . . as long as you can get cheap sides of salmon that is. Excellent when comlpimented by a glass of chilled white wine! 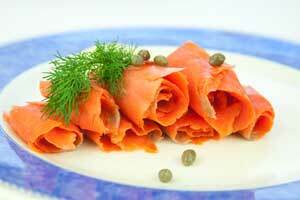 Enjoy your Gravlax and bon appetit . . . . .